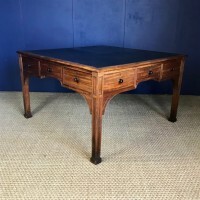 An imposing George IV mahogany partners writing table circa 1825 attributed to Gillingtons of Dublin or Mack Williams and Gibton . 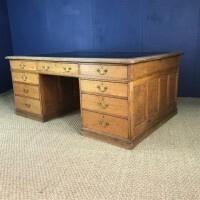 A very large Victorian oak partners desk circa 1890 with an arrangement of 9 drawers to back and front the sides with fielded panels. 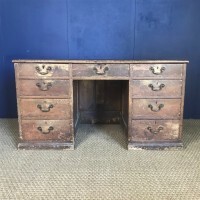 A late Georgian pine estate desk circa 1830 from a Devon Country House with the original oil cloth top and lovely crusty worn paint. The Provost of Eton`s 19th c oak Architectural Library Bookcase circa 1848 commissioned for Chilton Cantelo House near Yeovil Somerset . 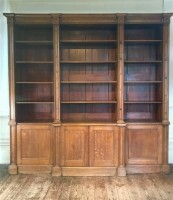 This grand library bookcase remained at Chilton Cantelo House for the next 169 years until removed by us when the house (which became a private school after the War) closed last year. See more details on the Provenance below. 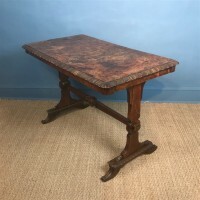 A William IV burr elm writing or sofa table table circa 1835 with a beautifully figured burr top on end supports united by a turned stretcher. 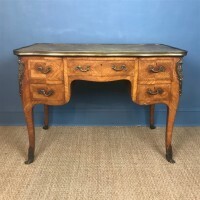 A late 19th c English Kingwood writing desk in the Louis XV French taste circa 1890 with the original faded brass banded green leather top above gilt brass mounted and oak lined drawers on Cabriole legs with sabot ends . An Anglo Indian Padouk open bookcase circa 1910 probably Bombay Furniture Company in Arts and Crafts style with three adjustable shelves. A William IV Gentleman`s Partners Desk c 1835 with patent locks hidden in the corbel stiles. 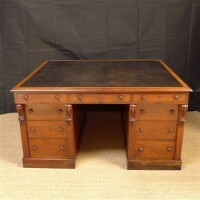 This is almost certainly a uniquely commissioned desk with drawers to both sides with patent locking stiles. 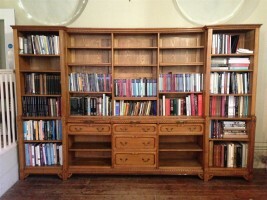 In beautiful figured & fiddle-back West Indies mahogany & original condition. Very Sympathetic Distressed Black/Green replaced leather with Greek Key blind tooling. 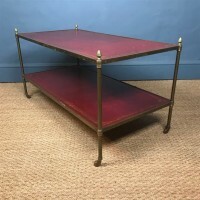 A wonderful piece for a Period Library. 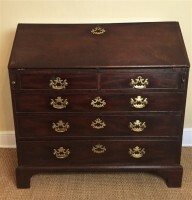 A Victorian walnut Wellington chest circa 1880 in the aesthetic movement manner with seven graduated drawers with original Gothic reform chased brass handles in the style of Bruce Talbert. 20 inches wide 16 inches deep 46 inches high. 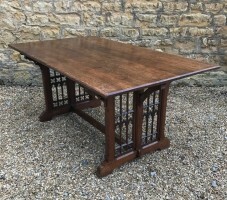 An early Victorian Gothic Oak library table c 1845 the design attributed to A W N Pugin The ends with delicate perpendicular Gothic tracery. 67 inches wide 39 inches deep 30 inches high. 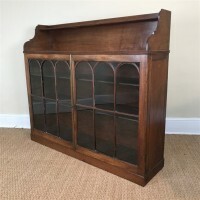 A Regency mahogany glazed cabinet bookcase circa 1825 in warm mellow mahogany with a pair of glazed gothic arched doorsdoors below panel slides and a stepped shelf surmount. 48 inches wide 12.5 inches deep 43 inches high. 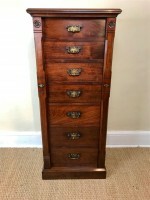 An early George 111 mahogany bureau c 1770 with the original open pierced brass handles and escutcheons and panel back on bracket feet. An impressive Gothic Reform oak open bookcase c 1875 by Brew and Claris Finsbury Place London. 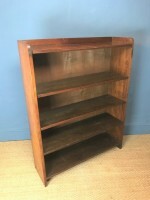 This stylish bookcase in rich honey coloured oak comes in 4 sections for easy movement and setting up. It has three brushing slides for placing books on with the original tooled leather and five drawers in the lower middle section.